Dr. Moelleken has been developing LiveFill® for years and it has become a regular part of his practice. Once LiveFill® has been placed in your body, it becomes an integral part of your body’s tissue and this is why the results are permanent. When a biopsy is taken of LiveFill®, it appears to be normal tissue, with its own blood supply and that is not true of any other filler available: temporary, permanent, or through a fat injection. The genetic markers of LiveFill® are identical to the patient’s so there is no chance of rejection. Occasionally, minor irregularities or an incomplete take of the graft, depending on the patient’s biology, can result from the LiveFill® technique but if this happens, the problems are corrected using local anesthesia. Healing time with LiveFill is very rapid since no over-correction is necessary and patients typically require a long weekend to recover. Depending on Dr. Moelleken’s recommendation, you may begin your normal exercise routine in approximately two weeks however each patient heals differently. 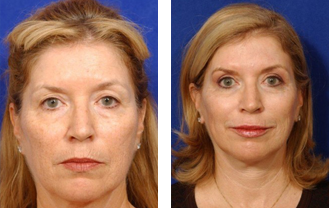 Dr. Moelleken is very excited about originating the LiveFill permanent lip augmentation procedure. He prefers permanent autologous fat-fascial grafts, (LiveFill (TM), for the lip over fat injections because he believes that completely non-traumatized grafts are fashioned specifically for the targeted area with better viability or the ability to live under certain conditions. The injection process for fat injection involves placing the fat through a small cannula, further traumatizing the fat and if you examined this fat, you would find very low viability. Dead cells predispose to granuloma formation and swelling as the body tries to dissolve the free fat vacuoles and dead cells. Dr. Moelleken prefers LiveFill due to less initial swelling, more predictability of the graft survival, and a soft, natural result. Lip augmentation should maximally enhance your existing lips, not produce a distorted version of them. When Dr. Moelleken performs a lip augmentation, he looks at your entire face because he considers the procedure an artistic endeavor. He does not just inflate lips and send people on their way because that does absolutely nothing for his patients. If he performs only a lip augmentation without filling other areas that have lost volume, disharmony is sure to ensue. During your consultation, Dr. Moelleken will carefully determine the best look all-inclusively instead of in one specific area. He will look at you as a whole person, making you beautiful as a whole person. 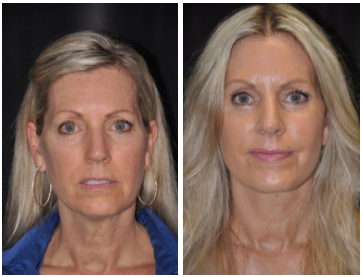 Dr. Moelleken is excited about this promising procedure and he frequently incorporates LiveFill® while performing facelifts (including his trademarked 360 Facelift®), blepharoplasty, brow lifts, or his signature superficial cheek lift operation. Call today and let us schedule a consultation that will help turn back the hands of time for your aging lips. The official medical definition of the lip is: either of the two fleshy folds that surround the opening of the mouth in humans and many other vertebrates and in humans are organs of speech essential to certain articulations; also: the pinkish or reddish margin of a human lip composed of non-glandular mucous membrane and usually exposed when the mouth takes on its natural set. Your lips’ exposed mucous membrane structure is different than your other skin. Your lips do not have the same protective outer layer (stratum corneum), nor do they have the same oil and sweat glands. Oil and sweat glands add moisture to skin but your lips’ only source of moisture is the saliva inside your mouth. Since your lips are composed of skin, muscle and mucosa, they have no bones or infrastructure. Your lips are red because the mucous membranes of your lips are full of capillaries (tiny blood vessels) that are close to the surface giving them a reddish color. Your lips also contain less pigment melanin in them and the lighter the skin; the less melanin pigment is contained making the skin more translucent. The skin on your lips is very thin compared to the rest of your facial skin and it is comprised of three to five cellular layers. This allows wind, cold, sun, and dryness to make your lips a vulnerable target for not just chapping but premature aging as well. As you get older, this already thin layer becomes progressively thinner.